Exit Strategy – What’s Yours? If you are attacked and want to escape to safety, what is your exit strategy? Think about it. If you had to decide in less than two seconds where you should run once you escape from an attacker, would you know where to go? We’ve recently looked at Evade to Escape and Evade to Enter. Both have the purpose of escaping to safety in two seconds or less, but how will you know which direction to run in that short time span? Keep in mind that you’ll be focused on escaping the attack, so where do you get the time to develop an exit strategy? The best time to develop an exit strategy is before someone attacks you. What! How can I develop an exit strategy before I’ve been attacked? Don’t I do that when I’m attacked? That is an option, but not the best option. You may remember our emphasis on Safe in Seconds. The first part of that safety plan is the 60 seconds before an attack. Every person who has ever been attacked had a period of 60 seconds prior to that attack. We use that 60 seconds to prepare ourselves for possible attack and one of the things we do is continually build our “exit strategy.” Why? Because the exits change as we move or as situations change. The worst position to be in is “unaware.” That’s where you have no idea what’s going on around you. You may take a nap and leave the doors unlocked. You may be walking on a sidewalk or in a store texting a friend or talking with someone on the phone. You are not paying attention to your environment at all and have no way to know you’re in danger until it hits you. A better position is to be “aware.” What does that look like? Keep your eyes and ears open for anyone or any animal that could attack you. Keep your eyes and ears open for any “thing” that might hurt you. Search for a way to exit your current location if you are suddenly attacked or otherwise in harm’s way. If you see or hear something that looks like it could lead to an attack or danger, you should quickly move into an “alert” position. My wife knows when I have moved from awareness to alert. My visual and audible “radar” is sweeping the area and I’m ready to move quickly to protect her or anyone else I’m with (e.g. grandchildren, friends). My self-defense plans, including an exit strategy, are ready to go. If someone moves aggressively toward me or someone I’m with, I immediately go into defense mode, which includes getting between the attacker and my family or friends. Martial arts has a long history that includes military functions (attack/defense). Many of the best martial arts systems and techniques have been field tested over many centuries. One of those systems is 60/360 situational awareness. Anyone who is now or has been in the military studied situational awareness in one form or another. However, you can be the best trained and armed person in the military, but if you aren’t aware of your surroundings – your training and weapons may not save your life or the lives of others. Our goal when attacked is to escape – get away from danger. Knowing how to defend yourself effectively in two seconds or less is an awesome skill. However, if you successfully escape an attacker only to discover that you don’t know how get from your current location to safety – you have a big problem. As you use the 60/360 Mindset throughout your day, keep your eyes open for exits – places that would allow you to get away if you had to quickly. Do you know where the nearest door, hallway or stairs are located that would lead you outside or to another part of a building or open area that would allow you to find a way to escape? If your attacker comes between you and your exit, do you have a plan for getting through, over, under or around your attacker to get to the exit? Is there more than one exit you can use? If so, do you know where each exit leads? Do you know which exits not to use? (e.g. an elevator is not a good place to run to unless it’s the only exit available). If you are surrounded by a group of people or several animals or a fire, do you know what you would do to get away safely? 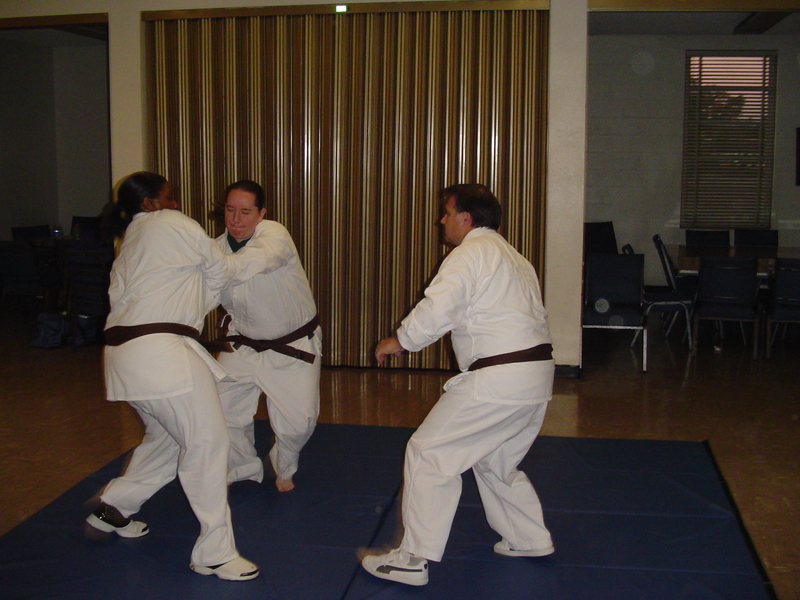 An important part of self-defense training in Grace Martial Arts is to develop a 60/360 Mindset and an Exit Strategy. We hope this article will help you build on both.